I'm an artist living in rural north Norfolk. 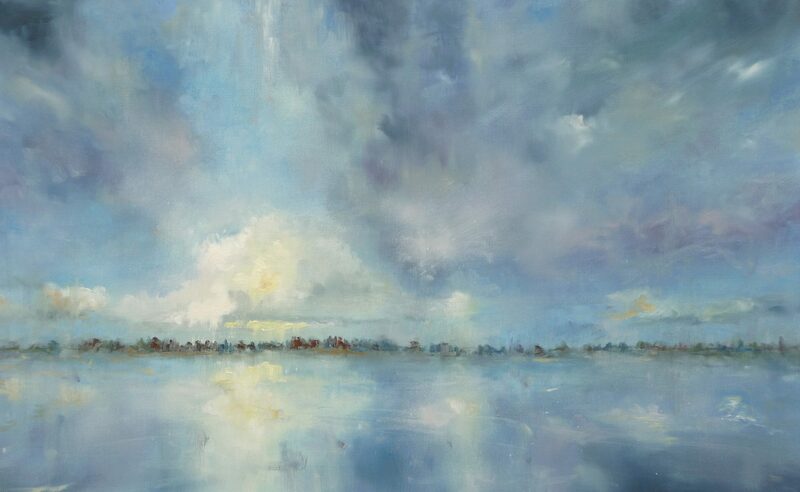 In my landscapes I try to capture the atmosphere and scale of our wonderful Norfolk skies. Currently , I am working on a series of African and Oriental heads using bright, saturated colours. The photographs do not do these paintings justice. In reality, the vibrant colours contrast beautifully with the matt black background and heavy 3d gold effects. CARD PAYMENTS ACCEPTED. PRICES INCLUDE FRAMES, BUT NOT POSTAGE. High Street, Ringstead, NORFOLK. PE36 5JU. THANK YOU TO EVERYONE WHO CAME TO OUR HUGELY SUCCESSFUL EXHIBITION. IT WAS LOVELY TO SEE OLD FRIENDS - AND MAKE NEW ONES TOO. I will be exhibiting with five other artists in aid of Tapping house Hospice. Brancaster Village Hall, Main Road, Brancaster Staithe, NORFOLK. PE31 8BY.